Northampton Borough Council’s already chequered reputation for its competence in dealing with heritage matters faces a new challenge, with allegations that a series of e-mails and reports, seen by thePipeLine, reveal a picture of delay dither and spin at the top of the council. The e-mails cover the period between October 2017 and the Spring of 2018 while the council grappled with reports which stated the nationally important Northampton Eleanor Cross required urgent conservation work. Most seriously the documents suggest that the East Midlands council was at least as concerned about media spin and downplaying the threats to the Cross as it was about actually undertaking emergency conservation work, when it ignored a report from a specialist structural engineer in November 2017 which suggested that parts of the cross were in such a poor state that it required strapping to prevent further damage or even collapse. The documents also suggest that at least one senior politician, cabinet member for Regeneration, Enterprise and Planning on the ruling conservative group, Councillor Tim Hadland, had knowledge of the state of the Cross and the recommendations to fix it far earlier than he has acknowledged previously, including in an interview with the BBC. The latest phase in the story of Northampton Borough Council’s alleged mishandling of the repair and restoration of the Northampton Eleanor Cross begins in October 2017. Following pressure from individuals and outside bodies such as the Save Our Eleanor Cross Facebook group, who demonstrated that the historic listed structure was visibly deteriorating, the Council consulted the statutory adviser and regulatory body Historic England and commissioned a specialist conservation company, Cliveden Conservation Ltd, to produce a survey and plan of proposed conservation works to stabilise the Eleanor Cross. In late October 2017, following disturbing observations about the state of parts of the Eleanor Cross made by their own staff, Cliveden brought in a specialist surveyor from Stress UK Ltd. As a result the “Interim Report for the Emergency Strapping Works to the Eleanor Cross Monument Northampton”, including photographs of the most vulnerable and potentially dangerous elements of the structure, was issued by Cliveden for delivery to Northampton Borough Council and Historic England on 27 November 2017. However, thePipeLine can reveal that all the parties involved had been discussing the contents of the interim report for almost a month at a senior level. Those involved in the discussions included Historic England and both senior officers of the Council, and at least one senior elected member of the Council, the Cabinet Member for Regeneration, Enterprise and Planning on the ruling Conservative group, Councillor Tim Hadland. The e-mail then notes that the structural engineer issued his report “yesterday”, i.e. 1 November. A follow up e-mail sent from Cliveden Conservation to at least one senior officer of Northampton Borough Council on 2 November , states that the report would be sent “now” to Mr A Jones, the Building Surveyor of Northampton Borough Council within the Department of Corporate Asset Management. The channels of communication between Clivedon and Mr Jones at NBC certainly seems to have been set up because on 7 November Mr Jones sent an e-mail which noted that Clivedon had advised putting temporary fencing around the site. The interim report suggests that this was needed as a safety measure to protect passers by because fragments of stone were falling off the cross. 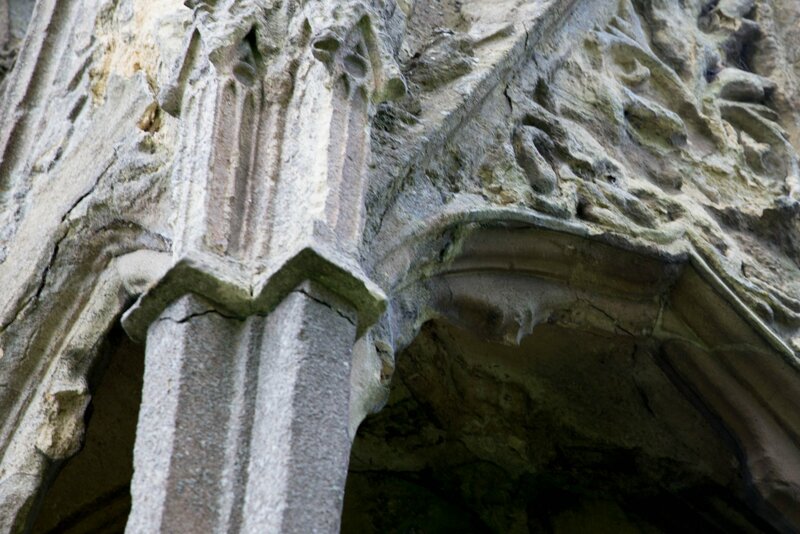 Cracking and flaking on the Northampton Eleanor Cross photographed in April 2018. By 7 November the e-mail thread shows the conversations about the Eleanor Cross had expanded to include Northampton’s Head of Planning Mr Peter Baguley. However, it is notable that by this stage, the communications about the state of the cross were also being copied to, or were actually run through, the desk of Mr Craig Forsyth, Northampton Borough Council’s Communications and Marketing Officer. For example, on 8 November Mr Forsyth was asked to comment on an e-mail from Ms Jane Jennings, to Cliveden Conservation seeking additional information about the level of risk the damage identified by Cliveden and Stress UK entailed. Mr Forsyth suggested specific wordings to Ms Jennings, whose Linked In profile describes her as a Team Leader for Northampton Borough Council, involved in Planning and the Historic Environment. While there is no suggestion he acted in any way improperly, Mr Forsyth’s concern appears to have been to keep control of the narrative in an attempt to show the council was responding to the concerns about the Cross in an appropriate and timely fashion. Part of this strategy was to control the language used by all concerned. The close involvement of Mr Forsyth suggests that senior managers at Northampton Borough Council were acutely aware of the reputational as well as physical dangers the controversy surrounding the Eleanor Cross represented to the council. Historic England were also involved in the public announcements about the Eleanor Cross. On 3 November the Inspector of Ancient Monuments in the Northampton office of Historic England expressed concern that the initial wording of a press release suggested that essential maintenance had been completed rather than just the initial phase of the necessary work. This was clearly a marker to the council that Historic England considered there was more the council needed to do to resolve the issues facing the Cross. However, there still appear to have been communications issues within the council itself. Even so, by the end of the first week in November 2017, other senior officers were now aware of the situation regarding the Cross and the reputational danger it represented to the council. Perhaps with that danger in mind, the decision making was now being referred to the very top of the council, with the senior elected member with responsibility for the Cross being brought into the loop. The “cabinet member” is understood to be a reference to Councillor Tim Hadland, Northampton Borough Council’s Cabinet Member for Regeneration, Enterprise and Planning. As you can see the structure has a crack in it and potentially presents a possible danger to the public hence the request for fencing and signage. To critics of the council that one e-mail encapsulates the root of the entire controversy surrounding the non-repair of the Eleanor Cross. The e-mail shows explicitly that both officers at the most senior level in Northampton Borough Council, and their political masters, were aware of the potential danger to the public, and to the survival of a nationally important monument, the Northampton Eleanor Cross, within days of that danger being identified by experienced, professional conservators and surveyors. The e-mail also shows that the same officers and elected members were equally aware of, and seemingly determined to avoid, any threat to their own reputations by doing their best to control the public and media narrative of the story. Senior council officer Paul Walker, informs his cabinet portfolio holder Cllr Tim Hadland by email about the damage to the Northampton Eleanor Cross and the need for strapping on 9 November 2017. However, another e-mail suggests there was also some indecision and drift at the top of Northampton Council as it tried to work out how to respond to the Cliveden report. However, four days earlier Northampton’s own Building Control Officer had intervened and offered the council an escape route from having to undertake the works immediately. In November 2017 Northampton Borough Council did fence off the Northampton Eleanor Cross to protect passers by from falling fragments of stone such as these. However, no other work was undertaken to stabilise the structure ahead of Winter 2017/2018 when freeze/thaw action might be expected to exacerbate blistering and cracking of the stone. “I do not consider the building to be an imminent danger requiring an emergency action under section 78 of the Buildings Act 1984,” the e-mail continued, that due to a significant crack there was the potential for part of the monument “to become dangerous” and concluded that the council should put appropriate fencing in place to protect the public and seek more information from Cliveden. As is now clear, the view of Northampton Borough Council’s own officer prevailed and apart from the fencing and earlier removal of vegetation which was damaging the monument, the emergency work, including strapping, recommended by Cliveden and Stress UK was never undertaken. However, it was not that further opportunities and the legal framework to undertake the work was not available. Indeed, all the parties appear to have carried on as if the work was going to happen. It is just that the actual work was kicked further down the road. Another e-mail, also seen by thePipeLine, shows that on 10 January 2018 Historic England told Northampton Borough Council that it had requested that the Secretary of State varied Scheduled Monument Consent to enable the “urgent repairs” to proceed. Historic England added that its Northampton Office would contact the Northampton Borough Architect “tomorrow” to finalise the application. There were also detailed, fully costed, specification for the actual works in place as Cliveden submitted their final report and recommendations on 4 February 2018. The first recommendation was that the emergency strapping work be undertaken as a prelude to a full conservation programme which would take place later in 2018. With the final recommendations of the expert conservators in place, a method statement approved by Historic England and the legal hurdles regarding Scheduled Monument Consent cleared the by mid January  at the latest, the only obstacle to carrying out the remedial work was Northampton Borough Council’s own willingness to commission that work. However, no more work was commissioned. At the root of that lack of willingness to commission the work appears to be that Northampton Borough Council was still arguing about who actually owned the Cross and was thus liable for the cost of the repairs. Of course, both officers and elected members have a duty to treat public finance with care and Northampton Borough Council is as cash strapped as every other local authority after seven years of significant Government cuts in core local government funding. Indeed, Northampton might be more disadvantaged than most as the Borough is also down at least a further eleven million pounds plus in the lost loan to the former owner of Northampton Town Football Club Mr David Cardoza and the legal costs of trying to get the money back. However, that is another story and is currently the subject of a Police investigation. When it comes to the Eleanor Cross the argument was whether it was the Borough or the County Council which actually owned it. That argument appears to have finally been closed by an email sent on 5 March 2018 by Theresa Boyd, a lawyer in Property Planning and Highways at the social enterprise legal firm LGSS Law Ltd.
Ms Boyd describes “investigative legal work” undertaken by herself and a colleague in response to conversations with Ms Jennings and Mr Forsyth at NBC. The conclusion Ms Boyd reported was that Northampton Borough Council undoubtedly owned the Eleanor Cross and had done since 1965. However, in addition to the fact that the emergency work was not commissioned and Historic England have confirmed that Northampton Borough Council only submitted an application for a grant to undertake work on the Eleanor Cross on 24 April 2018. This was three months after the grant of Scheduled Monument Consent for the work, a whole five months after Cliveden submitted the report notifying the council that the Eleanor Cross required “emergency strapping as soon as possible.” and almost six months on from the first notification of a potential danger to the cross and to the public. The e-mails demonstrate clearly, that Cllr Hadland was a party to the conversations about the state of the Eleanor Cross, at the most senior level in the Council. Later in the interview Cllr Hadland suggested that he was not familiar with the “interpretation” of the Cliveden report. In fact, by not correcting the BBC reporter who suggested he was not aware of the interpretation of the report, Cllr Hadland was being was somewhat disingenuous. As demonstrated above, the e-mails relating to the Eleanor Cross demonstrate clearly that Cllr Hadland was a party to the conversations about the state of the Cross at the most senior level in the council. Not only was the Interim Chief Executive made aware of the situation, Cllr Hadland himself had been briefed about the cracking on the cross and the potential danger to the public on 9 November 2017 by the lead officer for his portfolio, Paul Walker. In other words the chains of responsibility between professional officers and elected councillors appeared to be working properly. It is just that the council, and Councillor Hadland in particular, were not prepared to level with their electorate in Northampton, or the wider public who are concerned about the UK’s national heritage, about what they knew, when, or explain why they had not carried out the emergency work the Cliveden report called for. At one level the officers and elected members of Northampton Borough Council carried out their statutory duty in fencing off the Eleanor Cross to protect the public, when it was notified that there was a potential danger. There is also no suggestion that anyone acted improperly in other aspects of the controversy surrounding the failure to carry out the rest of the repairs to the Cross as recommended by Cliveden. However, it is fair to suggest, as its critics do, that the council has, at all stages, done the bare minimum necessary to stave off, not further damage to the Eleanor Cross, but to stave off further damage to the council’s reputation by muting, if only temporarily, the vociferous and effective public campaign by local people to see the Eleanor Cross properly conserved for their town and for the nation. This campaign of delay included pursuing the futile suggestion that the council did not even own the cross, and accepting the opinion of its own Building Control Manager that the repairs could be postponed once the immediate public safety issue had been solved, over the opinion of Cliveden and Stress UK that they should not be delayed. The controversy has also shown the limitations of the powers of Historic England. The statutory advisor and regulator has been reduced to the role of a bystander, watching the cross deteriorate in the hands of a landowner, Northampton Borough Council, whose strategy seem to have been to abrogate their responsibility as custodian of the heritage of the people of Northampton, while engineering a situation where the Cross would become someone else’s financial problem. A mission which has now been accomplished with the reported award of a grant from Historic England. Northampton Borough Council declined repeated invitations to comment on the specific allegations contained in this article. However, a spokesperson for the Council referred us to a press release dated 3 May 2018, which contains the following comments. “Cllr Tim Hadland, Cabinet member for regeneration, enterprise and planning, said: “We know this work needs to take place urgently and we are doing everything within our power to make that happen. “We recognise the cross is an important part of England’s heritage, and we must find a way of funding this work, which is why we’re pleased to be able to work in partnership with Historic England in moving the project forward. Responding to that press release, critics of the Northampton Borough Council suggest that those remedial measures referred to by Cllr Hadland are presumed to include the strapping which was first notified to Cllr Hadland and his colleague as being required to get the Northampton Eleanor Cross through Winter 2017/2018, almost year earlier than the date they would now be put in place. This is a timetable which suggests to critics that Cllr Hadland and his colleagues operate definitions of the terms “everything within our power” and “urgently” which are somewhat different to those used by everyone else working in buildings conservation. “I have not denied that I knew about the Cliveden report, merely that I had read it.